Who has two thumbs and just rocked her self-implemented post deadline!? This girl! Of course it took posting a photo of this plate-o-yum on IG to give me the push I needed. I have some very awesome friends with some very impatient squash (squashes? squashi? I think I’m overthinking this!) awaiting this recipe. I had to deliver! Without further adieu, here’s my all-time favorite butternut squash recipe. Hands-down. No question. This savory sweet side dish is perfect for the holidays and you should totally make it right now! Delightfully delicious! The combination of sweetness from the butternut squash and honey paired perfectly with the tart and juicy cranberries is a thing of beauty! The dish is super customizable too, so feel free to make it as sweet or sassy as you’d like. The feta adds a delightful twist, and can easily be swapped for an uber creamy goat cheese as well. I hope you love this tasty holiday side dish as much as we do! It’s become a staple in our house and I have a feeling it will be for years to come! This simple side can be whipped up with just a few fresh ingredients and is loaded with Fall flavor. As an added bonus, as the butternut squash roasts away it fills the house with the most delicious aromas. I had to hold myself back from climbing in the oven with it after the twenty minute mark. It was a little less Sylvia Plath and a little more was more “LET ME AT THAT SQUASH!” I may have stolen a few cubes to munch on when I added the cranberries. So good! Sooooo I read somewhere that when honey is cooked it loses a lot of it’s coveted antibacterial properties, boo. I still bake with it because it’s an awesome natural sweetener and I adore it so, but if I have the option to keep it as close to raw as possible, I do. 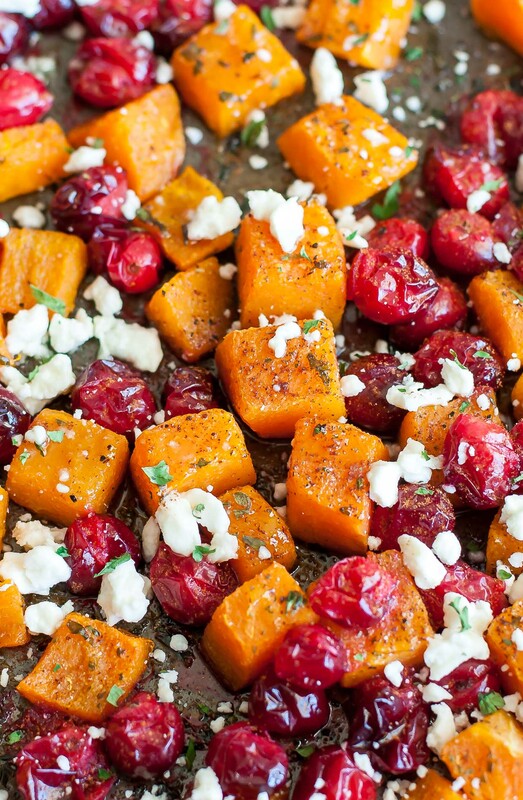 Hence adding the honey after roasting the squash and cranberries in this recipe. The fruit and veggie medley is still just warm enough to allow the honey to cover the dish as a deliciously sweet glaze, but not so scorching that it’s spending 30+ minutes in my oven losing all it’s fabulous benefits. File this under things I tell myself so I can eat more honey. If you’re as squash obsessed as I am right now, you should totally take your Fall/Winter menu up a few notches and try my Cheesy Garlic Parmesan Spaghetti Squash and Butternut Cauliflower Soup. 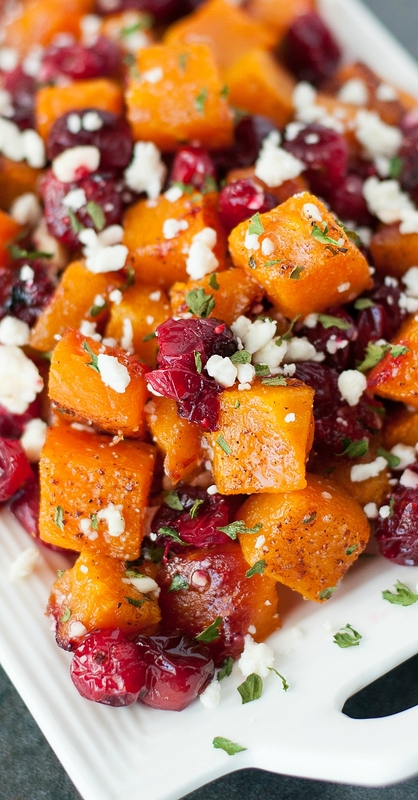 If you get a chance to try this Honey Roasted Butternut Squash with Cranberries and Feta, let me know! Need to make this dish in advance? I’ve done some experimenting and here’s what I’ve got so far! I’ve found the best advance-prep results were when I pre-roasted the squash for around 25-30 minutes and then before serving, I tossed the room temperature squash back in the oven along with the cranberries for an additional 10 minutes or so until the cranberries started to burst and the squash crisped back up around the edges (yet still creamy and buttery on the inside!). I reheated it in the oven just before serving so the feta and honey were added to the still-warm dish and it worked great! I have also cooked the squash and berries in their entirety and popped them in the fridge. I let it come to room temp for a bit then reheated them in the oven for around 10 minutes before serving, adding the cheese/honey after as well. The first method had more of the texture I was looking for but the results from this method were still good! Let me know if you find another method that works great for you as well! Last year I even slapped the leftover honey roasted butternut squash with cranberries on an epic Thanksgiving leftover sandwich (with all the fixings) and it was amazing! I have made this recipe so many times. It delicious. I have also made it with extra vegs such as red onion, sweet potatoes, carrots and fresh garlic cloves. This recipe is good year round. Thank you for a great recipe. My 3-year-old son and I loved it. The men in the house did not care for it, though. I’ll make it again some time for a gathering of just mothers and toddlers. This was so good!! My husband said that I should be making dishes like this for the holidays versus the traditional sides so it was definitely a hit. Made the dish as instructed with fresh cranberries and it came out wonderfully. Will be making again. This is absolutely delicious! This is the third year in a row that I´ve made it, and I think that I like it better every year. The colors and flavors are so delightful. Thank you so much for sharing the recipe and also thank you for the making-ahead tips! This looks great. Can I make ahead and reheat? I’ve found the best advance-prep results were when I pre-roasted the squash for around 25-30 minutes and then before serving, I tossed the room temperature squash back in the oven along with the cranberries for an additional 10 minutes or so until the cranberries started to burst and the squash crisped back up around the edges (yet still creamy and buttery on the inside!) I did the reheat just before serving so the feta and honey were added to the still-warm dish and it worked great! I have also cooked the squash and berries in their entirety and then reheated those just before serving in the oven for around 10 minutes, adding the cheese/honey after as well. The first method had more of the texture I was looking for but the second was still good! I’ve also slapped the leftovers on an epic sandwich the next day and basically swoon-status over here! Can this be reheated easily? Are you looking to make it in advance or just wondering about any leftovers? Here’s my experimentation with both so far, lol! I found the best advance-prep results were when I pre-roasted the squash for around 25-30 minutes and then before serving, I tossed the room temperature squash back in the oven along with the cranberries for an additional 10 minutes or so until the cranberries started to burst and the squash crisped back up around the edges (yet still creamy and buttery on the inside!) I did the reheat just before serving so the feta and honey were added to the still-warm dish and it worked great! I have also cooked the squash and berries in their entirety and then reheated those just before serving in the oven for around 10 minutes, adding the cheese/honey after as well. The first method had more of the texture I was looking for but the second was still good! I’ve also slapped the leftovers on an epic sandwich the next day and basically swoon-status over here! Can you substitute frozen cubed butternut squash for fresh? Much of an impact? Make tonight for tomorrow? I found the best advance-prep results were when I pre-roasted the squash for around 25-30 minutes and then before serving, I tossed the room temperature squash back in the oven along with the cranberries for an additional 10 minutes or so until the cranberries started to burst and the squash crisped back up around the edges [yet still creamy and buttery on the inside, yum!] I did the reheat just before serving so the feta and honey were added to the still-warm dish and it worked great! As an alternate method, I cooked the squash and berries in their entirety and then reheated those just before serving in the oven for around 10 minutes, adding the cheese/honey after as well. The first method had more of the texture I was looking for but the second was still good! Hope this helps and that you have a wonderful Thanksgiving! This was a fantastic mix of flavors and quite festive. Will make it again for the holidays. Yay!!! So stoked it earned repeat status! Thanks Joyce! Do we turn the squash halfway through total bake? To evenly coat squash, place squash in large bowl and then add oil and salt. Shake covered bowl to coat squash. Jen, have you ever made this as a salad to be served chilled or at room temp or is served warm the best? LOVED IT! We did double the cranberries. I’ve put this side in my meal prep boxes and it reheats well (just hold on the feta until you reheat) it’s not bad cold either. This looks amazing! I would like to add to our Thanksgiving menu but have you ever tried making it the day before and reheating in a casserole dish? Thank you Christine! So I have a few tricks up my sleeve for that! I found the best advance-prep results were when I pre-roasted the squash for around 25-30 minutes and then before serving, I tossed the room temperature squash back in the oven along with the cranberries for an additional 10 minutes or so until the cranberries started to burst and the squash crisped back up around the edges [yet still creamy and buttery on the inside, yum!] I did the reheat just before serving so the feta and honey were added to the still-warm dish and it worked great! I also cooked the squash and berries in their entirety and then reheated those just before serving in the oven for around 10 minutes, adding the cheese/honey after as well. The first method had more of the texture I was looking for but the second was still good! Mmmm, it’s just the right balance of sweet and feta cheese, I love it. Leigh again – forgot to mention I used a sweet potato and maple syrup and stevia to taste as that was what I had in the house. Quick and easy and delicious. Feta and cranberries are some of my favourite things! I keep frozen cranberries in my freezer year round and often make cranberry sauce or cranberry orange sauce during the year. I tried your recipe tonight and loved it!! I would never have thought to do this. I paired it with a stuffed chicken breast. A simple yet elegant Sunday meal. Thank you so much for sharing!! I know this will be one of my favourite meals and very easy to prepare for a quick week night dinner! Hi Judy! Since sizes of fresh cubed butternut squash packages vary store to store, I’d go by weight. Aim for around 6-7 pounds of fresh butternut squash and double the recipe and you should be good to go! A few people have used dried cranberries and for those you will skip the roasting and instead soak them in some warm water for a few minutes to plump them up and soften the dried berries. Since they’re sweeter than fresh cranberries, the amount you add will vary based on personal taste since the sweetness factor is such a personal matter. You’ve got this! We loved this but did change a few things. Used precut squash cubes, tossed with olive oil, salt & pepper and roasted. After roasting the squash, added dried cranberries and put back in the oven for 10 minutes to heat through. Then removed pan from oven, added goat cheese, mixed it all together and served. It was delicious. We didn’t use honey because the dried cranberries were sweetened and didn’t use cinnamon. Served it to company (6 people) and everyone loved it. Unfortunately we only had a spoonful of leftovers! This was delicious! I bought cubed squash and baked it for a long time (at 350 cause I had potatoes in the oven too). The squash released a lot of water so I just baked it until it finally dried up and started to get somewhat crispy. I added pecans, dried cranberries and goat cheese. Didn’t need any additional sweeterners. Served to company and everyone raved about it. Highly recommend. Looking forward to leftovers but sadly I don’t have a lot!! I just added this to my Thanksgiving menu this year. With a 16 year old, a 13 year old and a 10 year old, there will definitely be feedback. It sounds delicious. That’s why I’m going to give it a try. I’m excited you’ll be trying it Mary Ann! Hoping it’s a hit with your crew! If they’re not a fan of tart cranberries you can do half fresh half dried or just let them add a little sweetness to taste to balance it out per their preference. I go all out and swirl mine into my mashed potatoes and/or stuffing! Have you ever made this with sweet potatoes instead of squash? Hey Christi! I interchange them in recipes a ton – I say go for it! It should be glorious with sweet potato as well. This is absolutely delicious. I made it as a side for this past Easter Sunday dinner and everyone raved about it. I highly recommend! Delicious.Made it for Christmas as a side dish.Served with ham and salad.Great recipe will save it and make it again. This is a delicious side dish! My mother has prepared it for us a few times and now I’m going to make it at home. I have a quick question … I’m on a diet and need to calculate nutritional value … about how many servings are in this recipe and what would the serving sizes be? Thanks! I love all those colors. I know this is meant to be a Fall dish but I could eat it all year round. Those cranberries with butternut squash are so tempting. Yum! I decided to make this recipe in January when cranberries are out of season, so I had to use frozen cranberries. Also, I thought I had feta in the fridge, but only had goat cheese. Other than those two modifications, I followed the recipe and it turned out just fine. My family loved the tangy cranberries balanced by the goat cheese, butternut squash, and honey. Definitely a healthy recipe I’ll make again! This is amazingly delicious! Thank you so much for sharing. I totally have to make this! I have been obsessed with butternut squash lately. And since I gave up refined sugar, this is perfect for me! Pinning! ? Happy Holidays to you and your family! Hope you adore the recipe, Sherri, thank you! 🙂 Happy Holidays to y’all as well, hope it’s magical! I have made this before and it was delicious. However, I’m wanting to make it again and a family member is allergic to cinnamon. What would be a good substitute or do you think it would just be good without? Hey Jenn! (great name btw!) You can skip the cinnamon without a swap and it’ll still be great! Slightly sweet, tart dish. Beautiful addition to Thanksgiving table. Use good feta… Worth the cost. Great name! Ha! I made this last year for an expat thanksgiving over here in london and i am making it again today for tonight’s friendsgiving dinner. luckily, i was able to find cranberries in london both years! Thanks for the great recipe – it has become a favorite in my home and I can’t wait to share with family when we move back to the States! This looks scrumptious, gonna make it for holiday. I WISH I could print out this recipe without all the darn comments, which use up paper. I bet I am doing something wrong? Easy to fix? Oh yes totally easy fix Ann! Near the top of the recipe card under the photo is a print button that just prints the recipe with one very small photo! Let me know if you need help locating it! So stoked you’ll be making this for the holidays! I tried this last Thanksgiving, and it was a big hit. It’s been requested that I make it AGAIN this year. Last year I ended up cooking the squash in the pan with the turkey, and that was really moist and flavorful. It’s also beautiful–really colorful combination. Sue you just made my morning! Thank you! So thrilled it was a hit and that this dish will be on both our tables again this year! 🙂 Have a Happy Thanksgiving!!! Hi Jenn! I’m making this for thanksgiving this year. My original plan was to steam butternut squash (due to oven space) and just pour over an herb butter sauce but then I found this. What do you think about steaming the squash, Then heating some cranberries on the stove, then pouring it all together? Can’t wait to taste this!! So excited you’ll be trying it Cathi! How about sautéing instead of steaming? If you let a big stainless skillet get nice and hot with some butter (wait until the butter gets frothy to add the squash) you can get a nice golden edge on the squash and it’ll add the most amazing flavor! I’d give it a few minutes to get golden then flip and crisp up the other side too. This is sooo good! I onlY made 1/2 recipe because it sas Just me, but what a tasty ComBO! Can I make this ahead then reheat in a Crock-Pot? How many seRvings does tvjs make? How many servings would you say the recipe makes? I love butternut squash and this sounds perfect for THANKSGIVING…We have 14 people though, so I need to make enough. Can’t wait to try it! I know this is an old post so maybe you’re not monitoring comments any more… I had almost exactly this dish at a Bonefish Grill last week. It was a “fall menu” special that was just described as “fall vegetable medley” served with the cedar planked Steelhead (yum!). Their version seemed to have an herb or spice that was a little darker and more “earthy” than just cinnamon. It was definitely not cumin – or not just cumin. I am thinking I will try Garam Masala if I don’t find any other suggestions before I make it. Have you ever had their version? Any idea what they might use to season theirs? Thanks! Hey Carl! The fun thing about this side dish is that you can actually veer from the sweet and savory flavor profile and indeed put an earthier spin on it. Did the version you tried at Bonefish have a little kick to it heat-wise at all? One of my favorite little spice combinations to kick dishes up with is a medley of cumin, smoked paprika, cayenne pepper, and garlic. Garahm Masala sounds like it would be a fun one to experiment with as well! The maple syrup is great! I baked the squash ahead of time, then later added the cranberries at our dinner destination. Once they were plump and popped I added the maple syrup and tossed it all together, then drizzled some more on top for good measure 🙂 Just before serving I sprinkled generously with crumbled goat cheese. It was delicious! I interchange roasting pan and baking sheet (whichever you use is a-ok, sorry for the confusion) Both will be cooked on the same sheet/pan but you’ll do the butternut first and after 25 minutes have passed add the cranberries along with it. Honey maintains more of it’s healthy properties if it’s not cooked, so you can add it after the fact for this reason, or drizzle it on the butternut before roasting if you’d prefer. Either method works great! I was wondering if there is any way to make this ahead of time, and then reheat it for a party. I’m thinking roast your squash, maybe freeze it, or refrigerate it. Then day of heat it up, add the cranberries, and then feta right before serving? What are your thoughts? Not a good idea at all maybe? Thanks!! Hey Becca! I’ve had a few people mention they have roasted the squash in advance and pulled it out early so it’s softened but not fully cooked. Then store in the fridge and pop the cranberries on the sheet when you heat it up? I’ll admit I do love it best fresh, so maybe road test it ahead of time and see which method you prefer? This dish will as simply amazing! I adore butternut squash in any recipe so I’ll have to try this with the cranberries. I love the colors, and with the feta too. It looks good. Thanks for sharing. Hi Jamie! I don’t calculate the nutrition values currently (waiting to find a good recipe plug in to help me do that, and the tech crew on my current recipe card are hard at work) but until I can get things up and running myfitnesspal.com is amazing for calculations! Make sure to add in any changes in amounts/ingredients if you make any to get as accurate as possible 🙂 This recipe is one of my favorites — hope you get a chance to try it! Delish! I used dried cranberries because the store was out of fresh ones. Next time will try fresh. Keeper recipe… my husband and I loved it. Yayyyy! Yes girl rescue those crisper veggies! I’m excited to hear what you whip up! Happy New Year! Any idea how many actual CUPS of chopped butternut squash you used in this recipe? It is so hard to guess what a large squash is? Leaves a lot to interpretation. I’d love to try this recipe tomorrow with some of my homegrown squash that I have in the freezer already cubed and ready to go. Hey Chris, completely understandable! I wing my measurements a lot and a recipe like this is ultra forgiving. I’d say aim for 4-5 cups of butternut squash. The only issue you may run into is roasting the frozen squash. If you’ve done it a bunch before (You seem to be a squash pro since you grow it – I’d love to grow my own next year!) and like the softer roast texture from using frozen then totally go for it! You’ll want to adjust the bake time so you don’t end up with a baking sheet full of mush. Maybe try 15 minutes, flip the squash, then do another 15-20 minutes or until desired tenderness is reached.. Something along those lines? Hope this helps! I made this without the Feta cheese since I didn’t want to run to the store. Well, unexpected company arrived interrupting our dinner plans so we let this sit out to cool off. Later we just decided to put it with ham on Pumpernickle bread. Best sandwich ever! Thank you! Didn’t work for me…turned into a complete mush! EEK! So sorry to hear it Anna! Did you use frozen squash/berries by any chance or make any swaps that could have made it super soft? It always works when I make it each Fall/Winter. I just made this and it was the BOMB! I put cilantro instead of parsley. OMG I could have eaten the whole pan. OMG THE CILANTRO! Grace that sounds so refreshing! Thanks girly! Opened Pinterest to find a new side dish for Thanksgiving and this was the first one. Looks delightful and I will let you know how it turns out. Thank you! Thank you Mary Ann! Hope you adore it! Yum!! I just made this and it’s delish!! Great website, thanks for the recipe!! So glad you enjoyed it Kara!!! Thank you! I made this dish last night for me and the hubs and we both loved it! I knew we would, as roasted butternut is a fall favorite of ours. The cranberries and feta were a fabulous addition that I would never have thought of! I skipped the honey ( oops – I planned to add at the end with the feta but forgot) but we didn’t miss it, the butternut was sweet enough to contrast with the tart cranberries. I noticed that some folks mentioned having difficulty peeling the butternut. I have a Kitchenaid peeler and it cuts through the outer rind pretty easily for me. I think maybe it’s a little sharper then some of the other brands out there, so thought I’d mention it in case it helps one of your readers. Anyway, love your site and all of your refreshing ideas for taking veggie dishes from good to great! Thanks for your kind words Char and for sharing my recipes! I’m so thrilled y’all loved the recipe and love the peeler tip! I know a good sharp veggie peeler is for sure hard to come by so that for sure helps. Hope you have a wonderful weekend and a great holiday season! Thanks so much for stopping in and making my day with your comment! 🙂 So great to meet ya! I wonder how this would come out if I used sweet potatoes instead of the squash? Is there any way to make this or part of it, ahead of time? With all the other Thanksgiving dishes to make in a small kitchen, I’m not sure I would have time. Also, how many does this feed? I’m have 12 people to feed. Hi Beverly! This dish yields about 4 side dishes, depending on how much everyone grabs for their plate (at Thanksgiving everyone tends to take small scoops of each dish so it may even stretch from 4 to 6). I found the best pre-prep results were when I pre-roasted the squash for around 25-30 minutes and then before serving, I tossed the room temperature squash back in the oven along with the cranberries for an additional 10 minutes or so until the cranberries started to burst and the squash crisped back up around the edges [yet still creamy and buttery on the inside, yum!] I did the reheat just before serving so the feta and honey were added to the still-warm dish and it worked great! I also cooked the squash and berries in their entirety and then reheated those just before serving in the oven for around 10 minutes, adding the cheese/honey after as well. The first method had more of the texture I was looking for but the second was still good! Am so glad that I discovered your website. I like your philosophy of eating veggies. I love them all but am careless about eating them daily. From the looks of your recipes so far i think i will be more conscientious about eating more of them. Also I love the name of your website…so clevr! Thanks so much! <3 🙂 Let me know if you try anything! Wow this looks good. Was considering adding roasted pecans, thoughts? Also, with so many craisin ideas which do you prefer, fresh or dried? I’ll definitely be making this for Thanksgiving. I had another question? Would maple syrup work instead of honey? My crowd may be more open to that. But I don’t want to screw this dish up. So many people like the same-old same-old dishes, but I’m excited to try different things. Hoping to tempt the stalwarts! Hi Tracey, thanks! Maple syrup would totally work I believe, as I interchange it with honey for a lot of my recipes! If anything, a sprinkle of brown sugar across the cranberries will help with the tartness if the syrup doesn’t do the job entirely. I actually love the combo of a little brown sugar and pure maple syrup – YUM! Mmmmmm this looks awesome definitely going to make this. Think I might add some bacon – things always taste yummy with bacon. I know this is an old post but I just ran across this on Pinterest and want to ask, what is the calorie content on this dish? It looks so yummy and I really want to try it this Fall but am trying to watch my sugars and calories. Hi Cheryl! This is totally one of my favorite dishes! 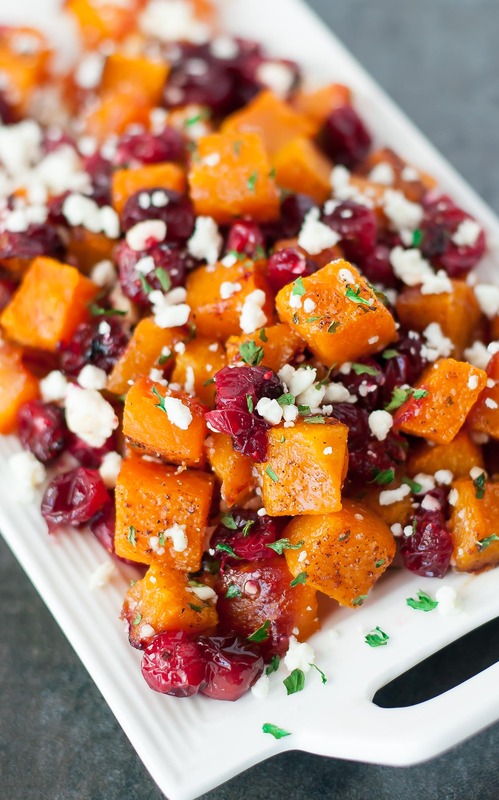 Butternut squash and fresh cranberries themselves are low in calories so how much honey and feta you choose to use will determine the main sugar/kcal content of the dish. Most of my readers use myfitnesspal.com to get an idea on the calculations, as this will let you customize how much of the feta/honey you want to use 🙂 Hope that helps! This was so easy and delicious! I loved the flavor combo! I used reduced sugar dried cranberries and to keep them from burning sprinkled them on in the last two minutes and it turned out perfect. Thanks for sharing! I wanted to try this tonight but my local supermarket didn’t have ANY cranberries and I didn’t have time to go elsewhere. So I improvised and used the closest thing they had: fresh cherries. I wasn’t sure how it would go but it’s delicious! I may never switch back to cranberries! I followed your recipe exactly, just switched the cranberries for cherries (cut in half and pitted). I was so sure it would be a disaster as I’ve never tried to cook anything savory with cherries before – although I generally love any kind of fruit-and-savory recipe, it’s like an obsession with me. I may turn out to be the only person who likes this, but I really thought it was delicious! I made this last night and it turned out amazing! I think I’ll stock up on fresh cranberries now that they are in season so I can make this on a regular basis. Thanks so much for the recipe! Haha when I’m still using my college set of pots/pans/sheets and have the bare minimum to work with 😉 Maybe santa will hook a girl up this year! How many servings is this? Thank you. Hey Jenna! The best approach is to measure out your servings via the squash. If you’ve chopped 4 cups of cubed butternut you can expect around 4 servings and if you’re using closer to six cups of squash you’ll have that many servings. I always think of how much squash I’m planning on piling my plate with and then plan accordingly haha, luckily the measurements are super flexible and you’ll be able to feed as many as you need to with a few adjustments <3 Hope that helps! Such a great looking dish! I don’t think I used a large enough squash b/c the cranberries overpowered everything. The kids learned the true meaning of tart tonight ? thanks for sharing! Wow, Jenn, this looks gorgeous! Most of my husband’s family unfortunately isn’t a big fan of trying new things for the holidays (or…well, ever, really), but after seeing this recipe on Pinterest yesterday it was all I could think about! It looks like the most incredible side dish for Thanksgiving. So I decided to get the ingredients and go for it! I have a game night on Monday nights, and I tend to try out new recipes on my friends there, so I’ll tell you how it goes. I also bought some walnuts to toast and toss in after roasting it. I just think a little crunch would go great with this (and I have a big thing for cranberry-walnut combos). Anyway, I wanted to say thank you for the recipe and inspiration! Thanks so so much Chelsea! I’m so glad you’ll be trying it! And heck yes to the walnuts! You could even toast them up on a skillet then add a little butter and brown sugar to candy them and then add them to the dish too! Looks. So delicious .Can you make this a day before and just warmed it up the next day? Great recipe! How many does this serve? I made this last night for dinner and my family loved it! I’m eating the cold leftovers for lunch right now and still love it. We are adding this to our Thanksgiving line up. Thanks! The recipe looks great, but not everyone (read, some women and most men) do not like feta, and especially don’t like goat cheese! Okay, myself included! I realize goat cheese is a trendy ingredient, but it really isn’t applicable to every recipe! There has to be a creamy-ish cheese, like a dried ricotta or a softer cheddar, that is readily available and doesn’t have the tangy “ickness” of goat cheese! Hey Karen! I completely understand. Several years ago I probably wouldn’t touch either cheese but now I love honeyed goat cheese and fresh feta, though I know I have friends who wouldn’t agree. That’s totally okay! This recipe is actually really great without any cheese at all. If you’re looking for a substitute for many of the recipes that call for these cheeses, I’ve heard Burrata is REALLY good as a soft creamy cheese. It’s a mozzarella that is super melty and creamy and great on salads/veggies, have you tried it? Try diced gouda or smoked gouda. It doesn’t have the creaminess that goat or feta has, but it has enough flavor to stand up to the cranberries and not fade into the squash. 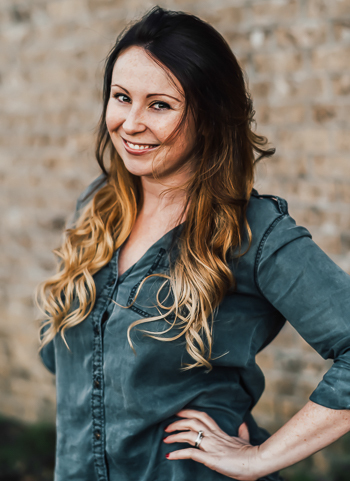 Hi Jenn – this is so pretty and sounds so good! I just want to let you know that I included it in my List of Fabulous Finds on my blog today … today’s finds are links to recipes for a completely fabulous Thanksgiving feast. I can’t wait to serve this! In fact – I’m not going to wait… I’m planning on making it for dinner one day this week! I’m making this for thanksgiving this weekend. Can I use frozen cranberries? Should I thaw them first? Hey Kathy! Super excited you’re trying it! I would partially thaw them first possibly. I think when you fully thaw cranberries they get super soft right? Softer than fresh, kind of like blueberries? I’ve made it with dried cranberries and it’s super tasty but I haven’t tried frozen yet! This was easy and delicious. Thank you. Since you mentioned that you roast a butternut squash almost every week, I was wondering if you had any hints for peeling the darned things. I always feel as if I’m in danger of becoming an amputee whenever I try to peel a winter squash. I love this recipe!!!!! I found myself making it almost every week 🙂 So delicious and a new spin on butternut squash for me. Yum Yum! I couldn’t find fresh cranberries so I opted for the canned variety, should this still be okay if I rinse them off? 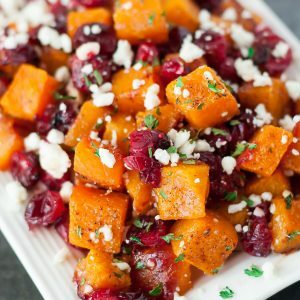 So I decided to try your butternut squash cranberry feta recipe for Christmas dinner and I think we were all more excited about trying it than the turkey! I don’t know if I didn’t do it right but it was a complete flop! Everyone thought there were way too many cranberries and that it was just too tart for their taste and th feta only added to that taste. It’s such a simple recipe, I can’t think what I must’ve missed but I know the next time I will cut the cranberries in half, think about using craisins instead, and probably try goat cheese as another reader suggested. Any other ideas? Thanks! I hate to cheapen the recipe but I only have dried cranberries on hand-would these work just as well? Hey Thanks for the response! I am cooking for 9 people. There will be a main course and two other side dishes besides this. Thanks again! sorry if I’m being blind, but how many side servings does this make? It looks awesome and Im hoping to make it for Christmas dinner! Thanks! Yum! I think the combo would be lovely if you’re a cherry fan! Yay! Happy to hear you loved it! Ooooh! Thanks for giving me a dinner idea for tonight! I think I’ll toss in some pumpkin seeds at the end and serve over spinach making it a warm-ish yummy salad!!!! Just a note to say you can roast butternut squash seeds just like pumpkin seeds! Thank you for this recipe. I made it for Thanksgiving, and it was so popular I’m making it again for Christmas! Thank you thank you! I’m totally craving some squash seeds now 🙂 YUM! I wish I had a formal measurement, but I was home alone each time I made it and kind of attacked the whole thing myself. So embarrassing! I would imagine it would make a decent-sized side dish for four, and possibly 6 or more if everyone takes a smaller, Thanksgiving-sized sample portion. Hope that helps! <3 Happy early Thanksgiving! I’d like to hear how the advance prep went too. Wondering how long it will hold. Maybe in a crockpot? Maybe add the cheese at the last minute? This looks fantastic! I’m all about the roasted veggies paired with fruit right now—sweet potatoes with apples and goat cheese has been happening a lot. This looks right up my alley too! I think your recipe photo is broken, in the recipe area itself? eek really? still? I don’t see it! Thanks for the heads up! And this looks amazing. I need to bring a dish to Thanksgiving dinner, and I just found it. You rock my socks, also my squash (squashes, squashi) stack in the basement. This looks SO delicious! I’m thinking of making it for Thanksgiving. Thanks, Jenn! Thanks Fran!!!! <3 Hope you love it as much as I do! I've made it twice already and of course I need more in my life stat! Will this dish hold up at room temp? I’m thinking Thanksgiving when ovens will be otherwise occupied last minute. Hey Marcia! I’ve had a bunch of readers leave comments and Instagram tags saying they loved it at room temperature. I’ll admit hot is my favorite but I’ll take this sassy side dish any way I can get it, as I know oven space for Thanksgiving is indeed prime real estate! Woah. Every recipe I see of yours just makes me so hungry! I love the looks of this and will definitely have to give it a try. I love the fall flavors in here! Squash and feta is such a great combo! This sounds AMAZING! I LOVE butternut squash right now, cannot get enough of it….but I think my other half definitely is! I don’t think he could argue with this one though, who could not love this with that combo! And such good runner fuel too! You’ll simply have to seduce him back to team butternut with this one =) Thanks Tina! My daughter made this dish for Thanksgiving and it was delicious!